On December 31st, I had a simple fall when my left ski went out as I was teaching my daughter to ski. I went down and immediately knew that something was wrong. MRI results show a complete tear of MCL, ACL, PCL and medial meniscus damage. I have little to no range of motion in my left knee. Swelling has finally gone down and bruising is dissappearing but that knee won't bend. I start physio tomorrow and healing the MCL is the priority before ACL/PCL surgery. 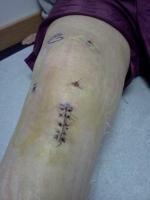 Wondering how long it will take to get this knee bending to a point where the surgeon will operate on the other issues? I have many questions for him next month.